The project team visited Llandaff Cathedral on 11 November 2017, resuming our visits to places around Wales to share new research underway on the project. The speakers were David Parsons, Ben Guy, Paul Russell and Martin Crampin. The talks ranged across church dedications to Dyfrig, Teilo and Euddogwy (the three Welsh saints associated with the cathedral); the early associations of Teilo with Llandaff; and the Latin and Welsh versions of the rights of Teilo (and the cathedral of Llandaff) which are recorded in the twelfth-century Book of Llandaff. 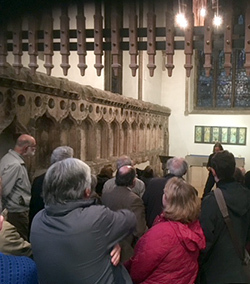 After tea, the final talk was held in the cathedral, in the Dyfrig chapel, where stained glass windows depict saints that are more associated with the vision of early Christianity in Wales held by Iolo Morganwg, than by Bishop Urban in the twelfth century. This was originally intended as the first stop on a tour of the cathedral to look at relief sculpture depicting the saints Teilo and Dyfrig by Frank Roper and Alan Durst, but there were so many of us that a ‘guided tour’ to each of these artworks was not really practicable! The project exhibition remained on display in the processional way until mid-December.